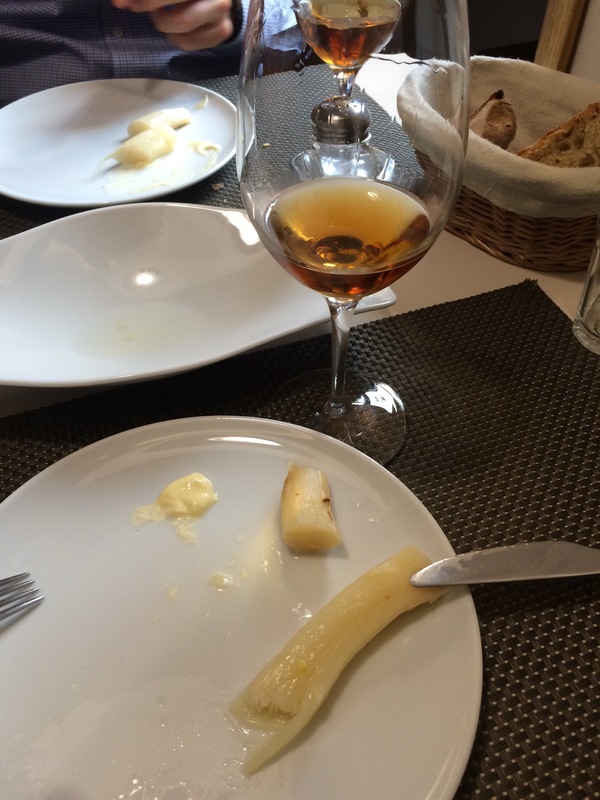 A lovely mellow amontillado Monteagudo (Delgado Zulueta) seen here with the remnants of white asparagus and smokey mayonaise with which it matched beautifully. In fact this was only the second of three sherries of a great lunch in one of Madrid’s top sherry venues: Taberna Verdejo. We started with a Sanchez Romate Fino Perdido and fried piparras, then this amontillado/asparagus combo, then a Gobernador Oloroso with sweetbreads with spring onions and a stew of callos, pata y morro to finish. Lovely wines, first class food and great pairings if I say so myself. You just can’t beat an old fino with green peppers and asparagus, the amontillado was caramel mellow and could cope with both asparagus and sweetbread and the oloroso with the callos – just a sure fire winner. Curiously, these callos are less spicy and more meaty than the average and the oloroso accompanied them all the way – such a versatile wine. As an added bonus I bumped into Antonio Barbadillo of Sacristia AB fame.